You probably want to know where I am at the moment! The answer is simple: I'm on vacation! Pavel has invented a time machine and we are exploring the Earth's past together! I'm in the picture above with Pavel, but can you find us? 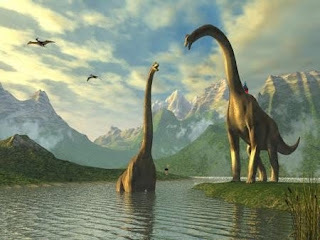 What are the names of the dinosaurs in the picture? I think the big dinosaurs with long necks have names beginning with 'B'. Perhaps you could use the internet to help me find out what they are called? Thanks for your help! I'm looking forward to seeing you all soon (if I'm not a tyrannosaurus rex's breakfast)! I think the names of the big dinosaurs are Bob and Brenda. Very funny, Seb! But when I said 'names beginning with B', I meant the scientific name of the dinosaur, like 'tyrannosaurus' begins with 'T'! No matter anyway. After I scratched his back with my beak, 'Bob' revealed that he was a... brachiosaurus! I found you and Pavel in the picture. Pavel was on the dinosaur's back and you were behind the dinosaur. You obviously have very good eyes! Stay tuned for more postcards soon!